Are you ready for the FCE exam? 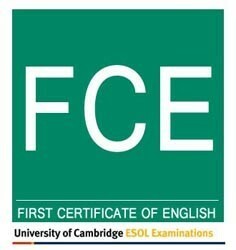 The FCE (First Certificate of English) exam - also known as the First for Schools exam - is used to gauge the English level of students who have an upper-intermediate level of English. The First for Schools exam has 5 parts which are Reading, Writing, Use of English, Listening and Speaking. The entire exam takes about 4 hours. Are you ready to take the FCE exam? Take this simple questionnaire to find out. Can you read and understand 2000 words of text in English? Are you sure you can read complex articles and pick out general the ideas and details? Have you ever answered English multiple choice questions with a time limit? Are you able to fill in the blanks in sentences and short paragraphs? Can you listen to multiple short English monologue and understand it all? Are you confident you can speak English with another person or student? If you answered 'no' to any of those questions, you may want to speak with one of Live Lingua's FCE tutors. The first trial FCE class is absolutely free. You can speak with the tutor to see if they think you are ready for the FCE test and they can propose a study plan for you. No credit card required, and no commitment. The FCE (First Certificate of English) exam is administered by schools for two reasons. The first is to gauge the progress of their students in the English language. The second is to help motivate the students to continue with their English studies. The FCE test is a built around familiar situations and topics to the students are meant to feel very comfortable with the material. The exam is broken down into the following sections with the listed time limit. Do you have any questions about the FCE (First Certificate of English for Schools) exam? You can speak to one of our FCE tutors for free to ask any question you may have. They will speak with you and evaluate how prepared you are. Speak To A FCE Tutor Today! What makes Live Lingua FCE tutoring different from the local tutors or enrolling at a local language school? And best of all, we let you meet and speak to your future FCE teacher before having to commit to paid classes! The more FCE lessons you enroll in at the same time, the cheaper the hour of class gets. Still not sure if Live Lingua FCE tutoring is the right choice for you? Then just try a free lesson with one of our tutors to make sure. No risk, no commitment. "[My English tutors] at Live Lingua have been great. I have been taking 2 classes a week, and then I change tutors every 2 months, and every tutor I have had so far has been great. I will be continuing with Live Lingua for a long time, and may even sign up to take other languages with them." "I got the highest score in my school on the EIKEN exam. I thank my English teacher at Live Lingua for helping me become the best I could be in English." "I love my English teacher. We have Skype English lessons two times a week and that helps me. At work they now ask me to check everybodies English!" "I just got the TOEFL score I was looking for and they admitted me in to a university in America. I will start next July and I am so excited."